Garhwal Rifles Regimental Centre (GRRC), Lansdowne has release an advertisement for the recruitment of Clerk (Male), Cook (Male) & Teacher (Male & Female). GRRC Lansdowne invites applications for filling up 04 posts Cook, Clerk & Teacher. These posts are purely on contractual basis. Interested Candidates may walk-in on 07 September 2018 for Written Test & 08 September 2018 for Interview. Note: Candidates of Jehrikhal, Deriyakhal & Lansdowne are only eligible to apply. For Post of Cook only domicile of Lansdowne are eligible to apply. Interested candidates may appear for Written Test on 07th September 2018 at 08:00 am and Interview on 08th September 2018 at Commandant Garhwal Rifles Regimental Centre Lansdowne. Self-attested copies of certificates in support of educational qualifications, experience etc. must also be brought along with the original Documents. 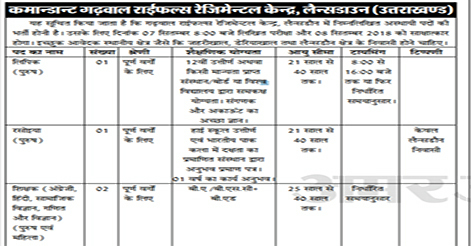 Help us to improve this article/job posting "Clerk, Cook & Teacher Recruitment in Garhwal Rifles Lansdowne". We would be glad if you can comment below and provide your valuable suggestions and feedback. If this page have any wrong information/list or out of context content, then you can report us as well. hi i am from satpuli can i fill this form. and tell me what is the process for this. Is there any registration form available for appearing in written examination for the post of a teacher?if it is then pls tell us the process or share the link where we can get that registration form? How can I apply ? Kya hum direct aake apne document jma kr skte hai. lansdwn tehsil h…can i apply? i have completed my 12th, diploma in information technology with one year experience as software apprentice in engineers india limited and have good knowledge of all related field so can i apply for clerk in garhwal rifles?? i’m from kotdwar but lives in delhi? I am graduate in commerce. Can I eligible for upcoming clerk post.